Yes to fasting. No to drugs, USDA, and dieting. This blog is about my journey to reverse Type II diabetes through fasting (or, more positively time-restricted feeding.). Warning: much of this blog will contradict what doctors say. Cutting to the chase, I’ll aim to document my own personal experiences with fasting, as well as relevant work from other researchers in the field. I’ve personally done 5-day fasts, and fasting has temporarily lowered my blood sugar levels. 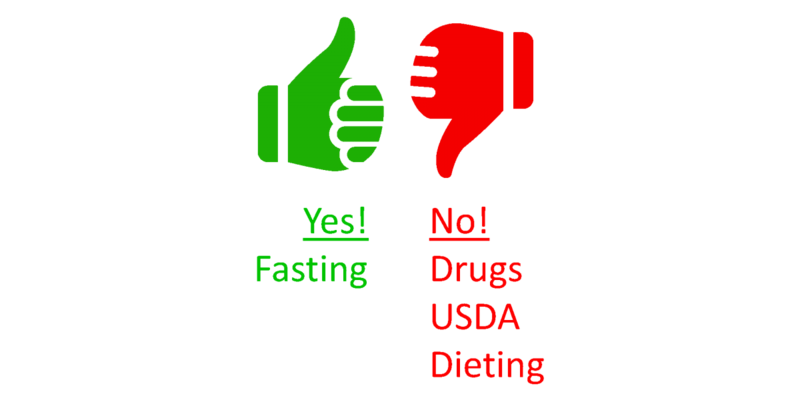 I will be experimenting later this month with more extended fasting (a 28 day program). More on this later in other articles! Most people don’t really understand Type II diabetes. I personally was surprised to learn I had diabetes through a routine life insurance medical exam in 2003. At the time, I was 36 years old, 5’10”, and 153 pounds (BMI=22). In the prior two years, I had completed four marathons and a one-day Seattle-to-Portland (“STP”) 200 mile bicycle ride. I am proof that diabetes can afflict those who are young, normal weight, and active. Today, over 29 million Americans live with diabetes, and 86 million Americans have prediabetes. More than 20% of health care spending in the US is for people with diabetes. The lack of success at a national level in treating diabetes and the enormous profit incentives make me question what the doctors or the drug companies say. Yet these drugs aren’t perfect — and they don’t always work in the long term. Even if you’ve been taking your medicine just as your doctor prescribed, you might not feel as well as you should. Diabetes drugs can and often do stop working. Eat more starches! It is healthiest for everyone to eat more whole grains, beans, and starchy vegetables such as peas, corn, potatoes and winter squash. Starches are good for you because they have very little fat, saturated fat, or cholesterol. Weight means a lot, but not everything. While 85% of diabetics are overweight, know this means that 15% are not. Weight doesn’t always correlate with diabetes and heart disease. On one end of the spectrum, there is some data to suggest that certain types of fat in obese people may have some health benefit. This phenomenon has been termed the “obesity paradox.”On the other end of the spectrum, thin people can get diabetes. In my case, as an Asian-American, I’ve come to learn that I’m not alone in being normal weight with diabetes. A 2016 LA Times article describes this phenomenon well. What Sinha noticed a decade ago is now supported by a growing body of scientific research: Asians, in part for genetic reasons, are disproportionately likely to develop diabetes. They get the disease at younger ages and lower weights than others, experts say. I am writing from the perspective of a very active patient, not a doctor or researcher. I encourage everyone to form their own opinions, some of which may conflict with the current “standard of care” in today’s Western Medicine or the sales pitches of today’s drug companies. I do believe the truth will come out over time, but it may not happen before many of today’s diabetics do irreversible damage to their organs. The punchline here is that I am saying “Yes” to fasting, and I will write about my experiences. Please share this blog with friends and loved ones who are also managing through diabetes and are looking for answers.